I put off writing my review of The Wonder for a couple of weeks after reading Kim’s excellent review. I couldn’t see how I could add anything more. But I have taken some time to forget about what she wrote so that I can concentrate on my own notes. Fans of Emma Donoghue will surely be picking this book up, but I hope that those of you who are new to Donoghue’s work will also consider reading it. Inspired by historical accounts of “Fasting Girls“, Donoghue has created a story about a young girl, her family, and her nurse. In an Irish village very soon after the terrible Potato Famine, Anna has stopped taking food. For months she has supposedly been living off of nothing, which has caused a great stir. People want to come see her, they want to know if this is for real. So a committee is formed; one that includes the local doctor and priest. They hire two nurses to take turns watching over the girl to ensure that she isn’t secretly taking in sustenance. Nurse Lib, who was trained by Florence Nightingale, travels to the village already with doubts as to the possibility of the situation. She imagines that she won’t be around long before the girl is discovered as a fraud. But, after a few days, it’s obvious to her that even if Anna had been receiving sustenance before the nurses began their watch, there certainly isn’t any way she could be now. Which means that the two-week watch could now be actually causing the girl to die. Lib tries to convince Anna to take food, but Anna refuses. Lib believes that if she can figure out the reason behind Anna’s decision to fast, she may be able to turn the tides. But what could it be? One week exactly since Lib had arrived from London. So full of confidence she’d been – misplaced confidence in her own acuity, it had turned out. She’d thought to be back at the hospital by now, putting Matron in her place. Instead she was trapped here, in these same greasy-feeling sheets, no nearer to understanding Anna O’Donnell than she’d been a week ago. Only more muddled, and exhausted, and troubled by her own part in these events. The beginning of the book, with the introduction to the story and the setting, immediately pulled me in; then there was a bit of a lag in the middle when I wondered if the rest of the book would just be Lib’s travels back and forth between the village and Anna’s cabin. But it picked up again as the race against time became obvious, and the frustrations Lib found herself coming up against in trying to deal with, and talk reason into, Anna’s family, her doctor, and the rest of the committee who were determined to see the two week observation period through to the end. The end was an exciting finish, but felt a little too ‘fairy tale-ish’ for my tastes. However, I’m sure there will be many readers out there who will find it satisfying. This book will do well. But as good as it is, and as popular as it will be, is it what the Giller jury is looking for? Are they looking for a good story? Or are they looking for a book that will make you question what you thought you knew, a book that will give you the urge to read it again, or one that leaves you with a burning desire to talk it over with friends? On November 7th, we will find out. *Thank you to HarperCollins Canada for sending me a copy of this book for review! 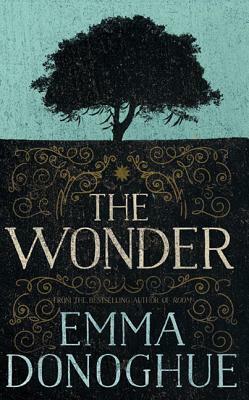 A review in The Star calls The Wonder a “powerful exploration of religion and the sway it holds“. A review in The New Yorker explores some of the history behind Donoghue’s book. Emma Donoghue’s interview with Shelagh Rogers on The Next Chapter. Thanks, BBs! Giller or no, still many great reasons to read this book. 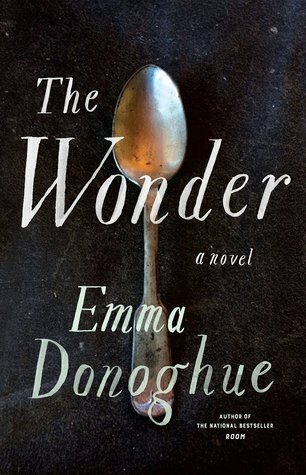 I am not a huge fan of Emma Donoghue myself, with no disrespect to her personally, but I did have an opportunity to hear her interviewed along with Eleanor Wachtel at Wordfest this past weekend. She is very intelligent and funny—it was a terrific event. She does choose interesting topics to write about – many that would need some in-depth research. I would think she would be very interesting/fun to listen to! Great review! I’ve only read Room by Emma Donoghue so far, but I do want to pick this one up as well. I think the premise sounds very interesting and I can also imagine very well I’ll be captivated by the portrayal of characters’ beliefs at the time. The historical aspect of this novel is what stood out for me. Very different from Room, but I think you’d like it! Nice review. I’m unfamiliar with the fasting girls phenomenon in history so I feel I need to brush up on what that was all about. I have just a gut feeling that this one won’t win the Giller but I look forward to hearing what does! The fasting girls are fascinating to read about! Oh, good! The premise for this one appealed to me right away, as well. It took me a while to get around to reading Room, but i did end up liking it a lot. Great review, as always. 🙂 The potato famine has so many great elements in it to weave stories around, but this is a new angle for me! Definitely adding this one to my TBR. The fact that the famine had just happened made the girl’s fast all the more significant – a waste of a good, healthy child! I’m in a similar place to roughghosts when it comes to this author. I had to read Room for book group even though it didn’t appeal to me. I’m not sure about this one either especially given your comments about the fairy tale-ish ending. Nevertheless, I’ve heard her being interviewed on the radio and she came across really well. An interesting author, but probably not for me! Thanks for weighing in, Jacqui! In your case, I might suggest just googling the Fasting Girls – it’s an interesting subject! I haven’t yet read any of the books on this year’s shortlist, but this is the one I’d like to read first. I loved both The Sealed Letter and Astray. Very thoughtful review, Naomi. I’ve tried my best with Emma Donoghue but enjoyed neither Room nor Frog Music. That said, this does sound like a fascinating story although I’m further put off by the idea of a fairy tale-ish ending. The good thing about the ending is that it happens very quickly. In my opinion, the rest of the book is probably worth the ending for most readers. Hmm… I’ll have to have a think about that! This stands out as one of my top reads of the year. I see why you and others think the ending is unrealistic. I experienced it as a relief — it could have gone so much darker. I looked at newspaper reviews of this novel and they were all over the place. Stephen King (!) reviewed it for the NYT and I think gave it a very balanced assessment: page-turning plot; not particularly interesting writing (though I’m not sure that’s fair). I can see why reviews would be all over the place. It’s a good story and good writing, but is maybe on the line between literary fiction and popular fiction? I really liked it, and yes, the ending was a relief – that’s the perfect way to look at it! Really, the other alternatives fro endings are not very cheery. I never got to finish the book before it had to go back to the library. There’s a modest wait list now, but eventually, it will be my turn again, and then I will be able to find out about that ending. I did like the setting and the voice, but I doubt that it will be a transformative read (though I don’t mean this in a negative way). Another nice thing about it is that is relatively quick to read – partly because it’s not too long, and partly because it’s a good story. So, when you get it back, you’ll have to come weigh-in on the ending! Hahahaha, well now I’m just dead curious what happens at the end. I am still not sure if I want to pick this one up — I’ve had very mixed experiences with Emma Donohue — but I’m at least going to grab it at the library and read the end LIKE A BARBARIAN. Oh, you get to read the end first! I would love to know whether or not you decide to read it based on what you think of the end. Do you go from the whole last chapter or just a few pages? I’m curious about this one an it’s on my to-read list. I like the book blurb a lot, sounds fascinating. I wasn’t a huge fan of ROOM, but it was decent enough. Great review! This is very different from Room, so you might want to give it a try. Thanks for commenting! I actually tend to like Emma Donoghue, but for some reason this one didn’t quite appeal to me. You’ve definitely made it sound more interesting! I’ve been super picky about historical fiction lately, so perhaps that was my initial worry, but it sounds like you’re right about questioning it for the Giller Prize. This is only the third book of hers that I have read – Astray and Room are the other two. All three have been very different, but I’ve liked them all well enough. The funny thing is that, even though I usually enjoy historical fiction, it was Frog Music that didn’t appeal to me, so I haven’t read that one yet. Sometimes I think we just go into and out of moods for a while, don’t we? We certainly are obsessed with food–eating it, not eating it, which food is “super food,” which food is “bad” food, etc. The next book I’m reviewing also includes food – 13 Ways of Looking at a Fat Girl. We really are obsessed. But I can kind of understand that, since it’s something that we all need to deal with every day. I look forward to your next review. I have the Fat Girl book on my to read pile. I read The New Yorker review when it came out, which cooled my enthusiasm for the book, but now I think I should pick it up (in all my spare time). I can’t believe I’ve never read one of her novels! I read an academic book of hers, though, which was quite good. I can’t imagine that you wouldn’t *like* it, even if you don’t end up *loving* it. Another one you might like is Astray – a collection of historical short stories. This DOES sound like a good book. I’m sure it will be successful, both on its own merit and due to Emma Donoghue’s previous successes. But judging by other reviews I’ve read, I don’t think it’ll get the top prize. Do you already have main contenders in mind? I’ve never read Donoghue before (Room seemed too sad for me to handle) but I have this one on my TBR and on hold at the library. Of her books, which is your favorite? I was asking myself that question the other day, but the three of her books I’ve read are all so different. Room is contemporary, The Wonder is historical, and Astray is a short story collection. If pushed, though, I’d have to go with Room. I thought it was quite an accomplishment to write about that subject without it being horrifying (I was also scared it would be). I was also amazed by her creativity with the day-to-day life of an adult and child stuck in a room together for so long with not a lot to do. The child’s whole life up until that point was one room. I really liked her early books (Hood, Stir-Fry, Slammerkin and most especially Kissing the Witch – which I just loved and which might explain some of the fairy-tale aspects you’ve noted in the ending of this one) but I didn’t enjoy the later ones quite as much. They felt more consciously shaped to me, in a way which distracted rather than enhanced the story for me. But that’s just me, and it’s great that she found so many new readers with Room and Astray ( read the former, but not the latter – though I’m encouraged by how much you enjoyed them). I’ve only read about 50 pages of this one so far, and I’m intrigued by Lib’s voice and position but I’m not exactly driven to return to reading it either, not so far…. Lib’s character as a nurse who had been trained by Nightingale was a good one – all the things she came up against as a professional and someone who didn’t have religion in her life. I think you’ll like her. But to warn you – her relationship with the journalist is extremely predictable. I find myself reacting inconsistently to Donoghue, although I thought Room was fairly good. What a strange subject for this one, though. The subject of The Wonder is what attracted me to it in the first place. I probably would have read it whether or not it ended up on the Giller list. It was a good read. I totally get what you mean about ‘fairy tale ending” but have to say that i was happy with that ending. From a nursing point of view, however, I am not sure it was realistic at all. I think a lot of people will be happy with it! I agree with your assessment of the book. I liked it, but thought the ending was a bit Hollywood feel-good movie. You also summarized what I could not after the reading the book- how well Donoghue did with the attitudes of the times. I had trouble with that because I could not disengage from modern day and so thought Lib’s attitude toward the Irish was appalling, but having read your review, I can see how and why she handled it that way. Thank you! It was appalling, though, wasn’t it? But that’s one of the reasons I really liked Lib’s character – she seemed very human to me because of her flaws.